Phonics instruction alone is not enough to help students learn and develop their spelling. There are a number of challenges that students face, not least, the fact that English is the most orthographically inconsistent language in the world! Below are a range of tips and strategies to use in the classroom to support students’ acquisition of spelling skills. This is a highly effective method for helping students learn the correct spelling of an irregular word. The advantage of this strategy is that it is highly multi-sensory – the student uses all modalities (visual, oral, auditory and kinaesthetic) to learn the word. Multi-sensory methods have been proven to aid retention. You will need to model this for the student initially until they can remember the strategy themselves. Write the word out for the student in this box and say each letter name as you write it. Give your students a selection of coloured felt tips and ask them to write over the word repeatedly using a different colour each time. The student should trace over the word several times using a different colour each time and say the each letter of the word as they do this. The student writes the word again, saying each letter out loud as they write. Fold the paper, so that boxes 1 and 2 cannot be seen. The student must now write the word from memory. The child now closes their eyes and attempts to write the word with their eyes closed, repeating each letter out loud as they do this. Repeat this activity at least 3 times a week to ensure that they can spell the word. Before students can use syllabification to spell words, they need to be able to identify and count the number of syllables in a word. 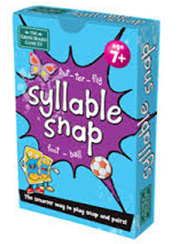 To learn and practice this skill, a card game such as the Syllable Snap (Brain box.co.uk) could be used as an interactive approach or simply to practise in class. When students understand what is meant by a syllable, show them how to break words into syllables in order to try and spell with more accuracy, e.g.: . im – por – tant. This strategy is useful with words that are phonetically decodable and is not recommended for words that contain complex or anomalous spelling patterns. In auditory mnemonic (a rhyme, jingle or silly saying) often helps with particularly tricky words: e.g: because – ‘big elephants can always understand small elephants. For this method, it can be helpful to use magnetic, wooden or scrabble letters. The student makes the word again, this time saying the letter names. A common method, LCWC be a useful strategy when time is short. Write the word for the student on card or paper. They look at it for 10 seconds, then cover it. The student attempts to write the word, naming the letters. The student checks their spelling against the spelling on the card. If there are any errors, the learner looks at the card again for a longer period of time and repeats the procedure. A key principle when teaching spelling to dyslexic is the importance of OVERLEARNING – any new spelling introduced to the learner needs to be revisited consistently until better accuracy has been observed. It is important to keep a record of what has been learnt. Remember not to overload the student with too many spellings to learn. 3 spellings a week can be more than enough. Below is an example of how you can record and monitor the retention of spellings learnt. As long as the principle of assessment and overlearning are maintained, any adaptation of this example can be used. Spellings to learn: because, friend, terrible. Monday – teach spelling of because (e.g. : using mnemonic or SOS). Tuesday – test student’s spelling of because. Wednesday – test students’ spelling of because and friend. Thursday: test spelling of because, terrible and friend. Only introduce new spellings once accuracy has been achieved over 3 days. Test spellings learnt in week 1 and repeat procedure. Excessive marking of spelling errors can maximize the student’s fear of writing and demoralise them. Prioritise content when marking and identify 1 or 2 spellings to be learnt for that week. Encourage the learner to see spelling accuracy as a spectrum – one incorrect letter in a word is a huge improvement, if the student previously used 3 incorrect letters. Tick correct letters in a target word. Spell the word for them and sound out the syllables or letters as you do. Give them the letters of the word and tell the student to try to spell it. Write a word that rhymes with the word they have asked for.